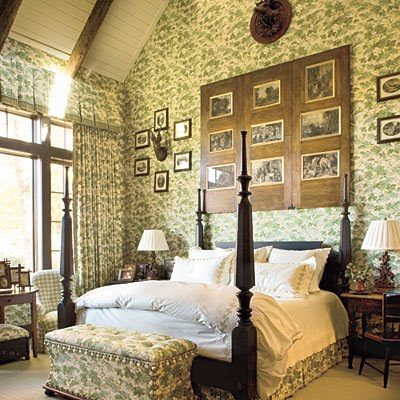 Love these ideas by Southern Living-most especially this beautiful bedroom. I think a small makeover in your bedroom can be simple yet very rewarding. "This master bedroom displays a more-is-more approach. Bravo to the beautiful screen above the headboard and the vaulted ceiling with its wood beams saved from an old barn. But the standing ovation goes to the abundant use of fabric. A green floral material wraps the walls like the woods outside and continues onto the bed, a bench, and the curtains. Accents such as the antique antlers, prints, and frames give the room even more mountain grandeur."